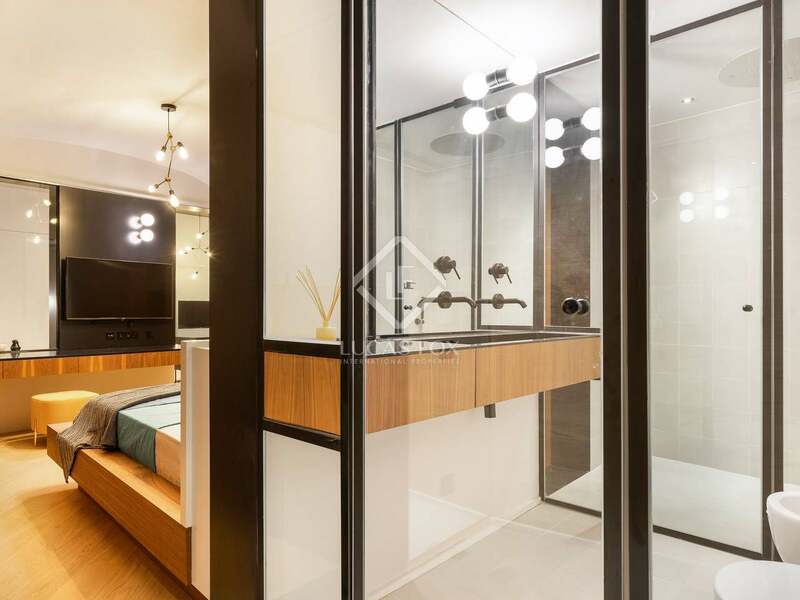 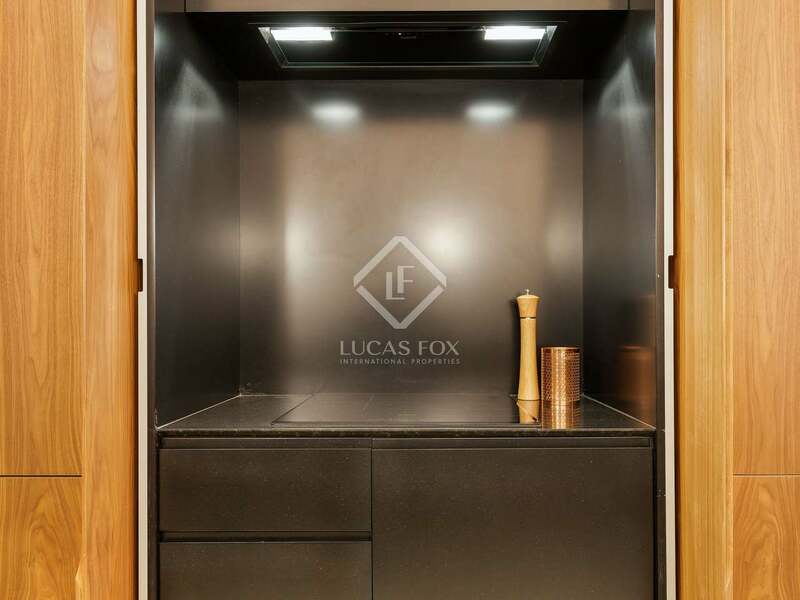 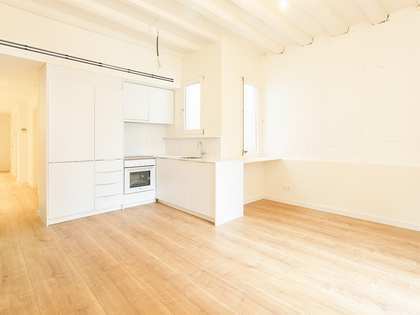 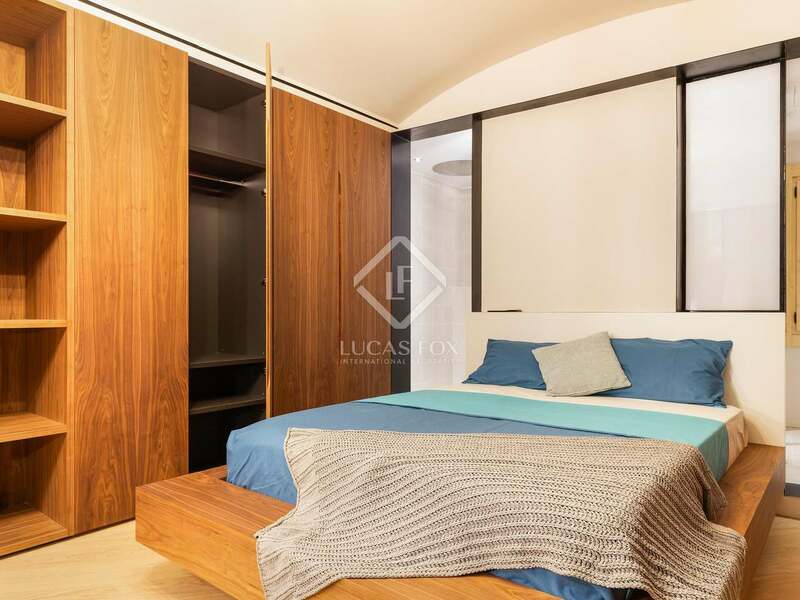 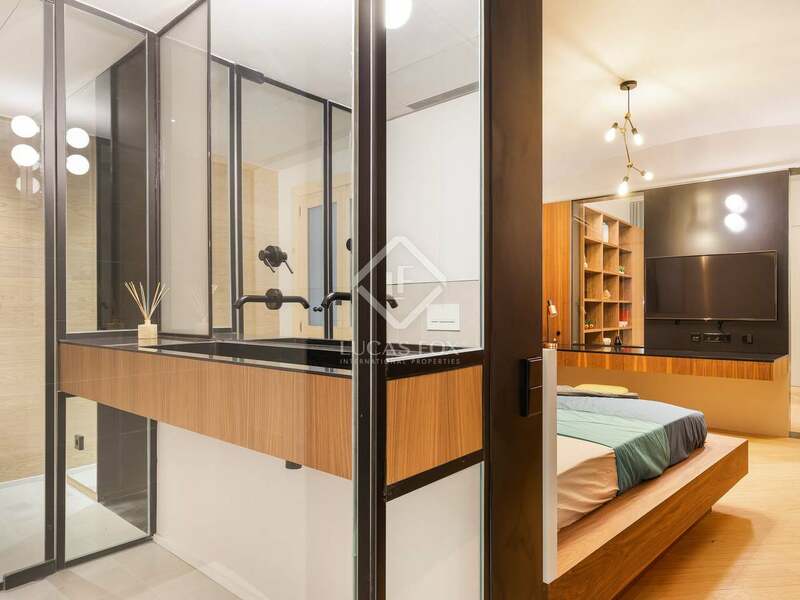 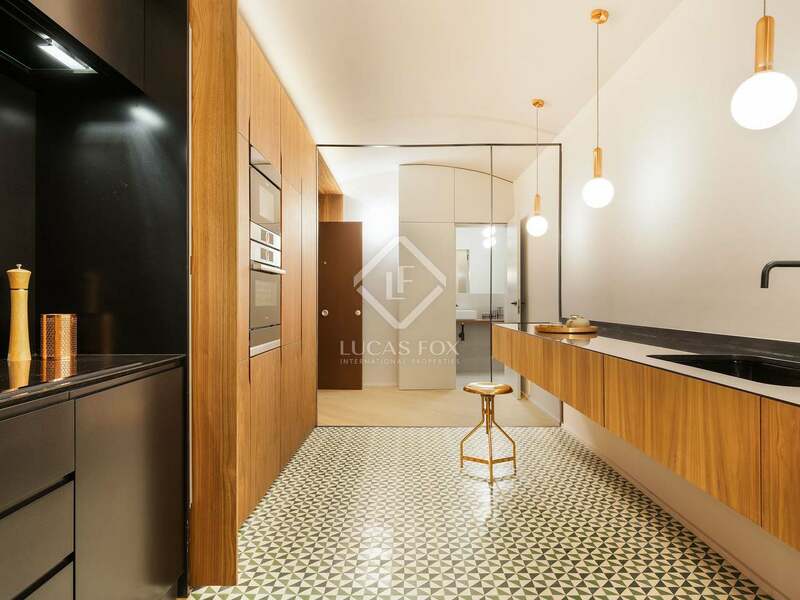 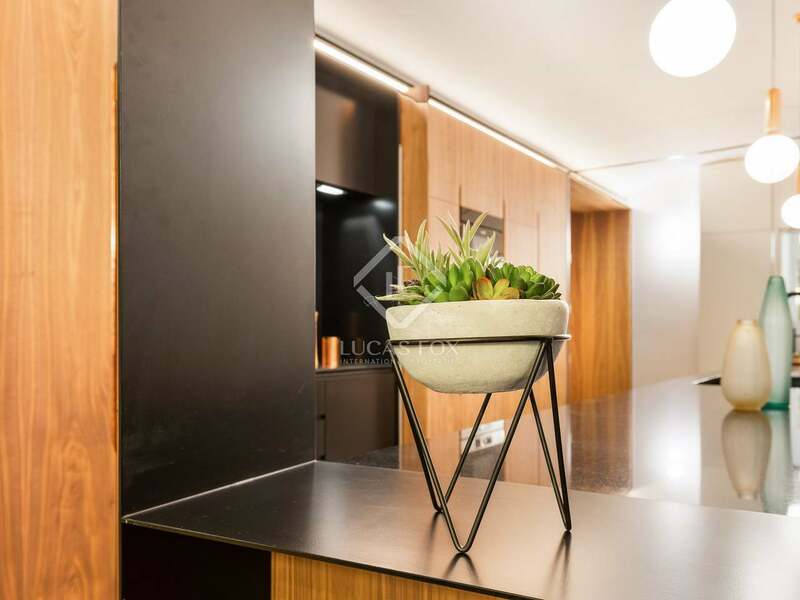 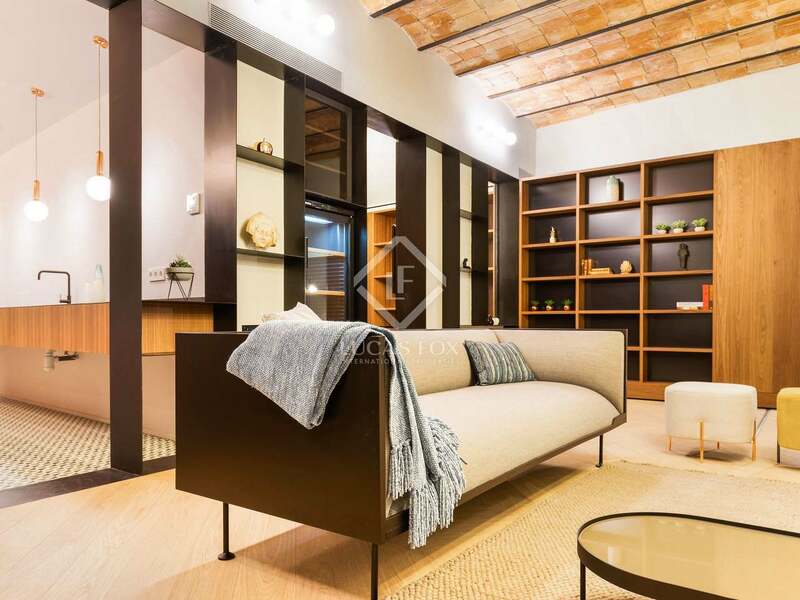 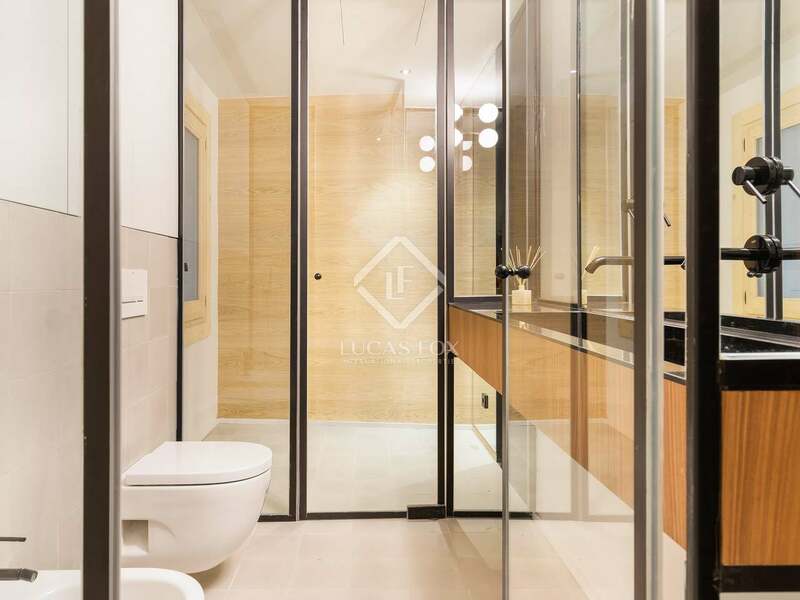 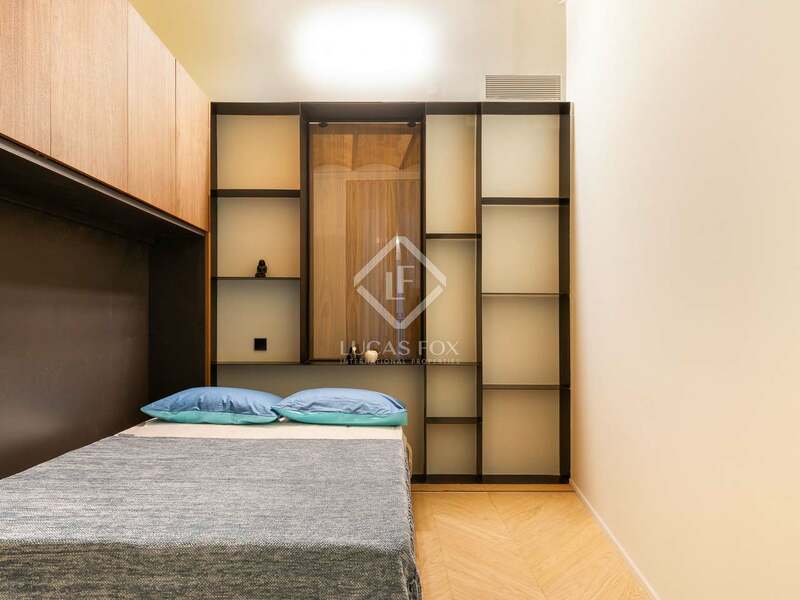 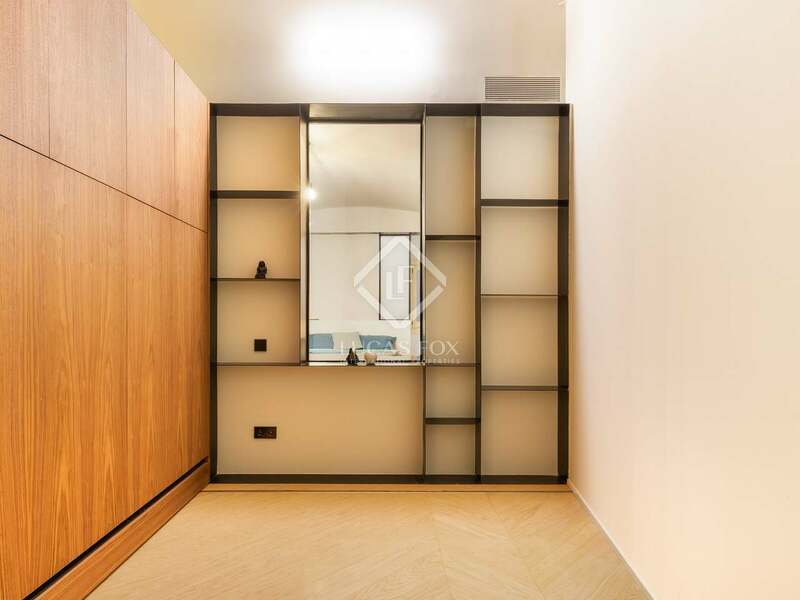 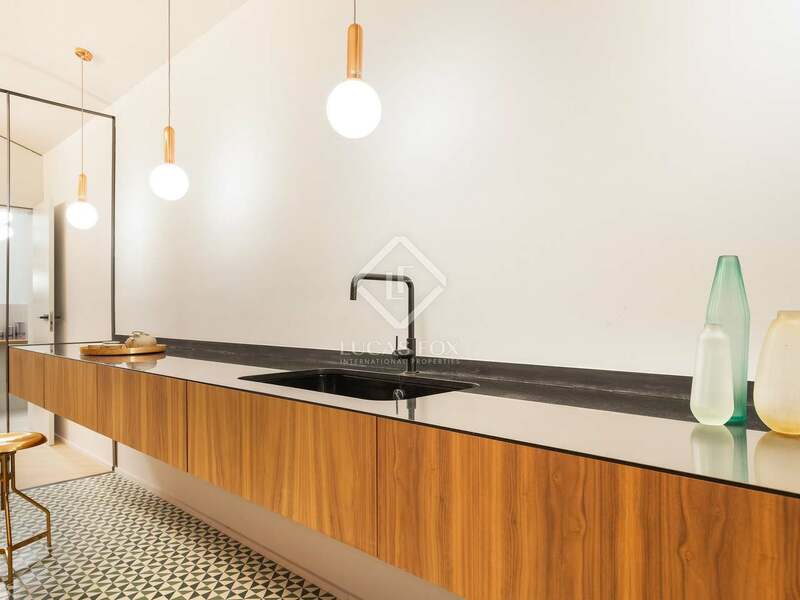 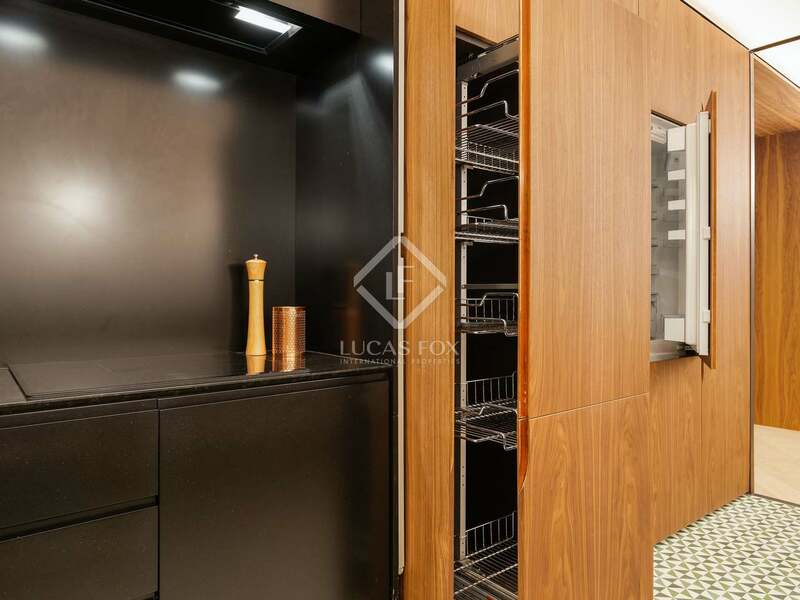 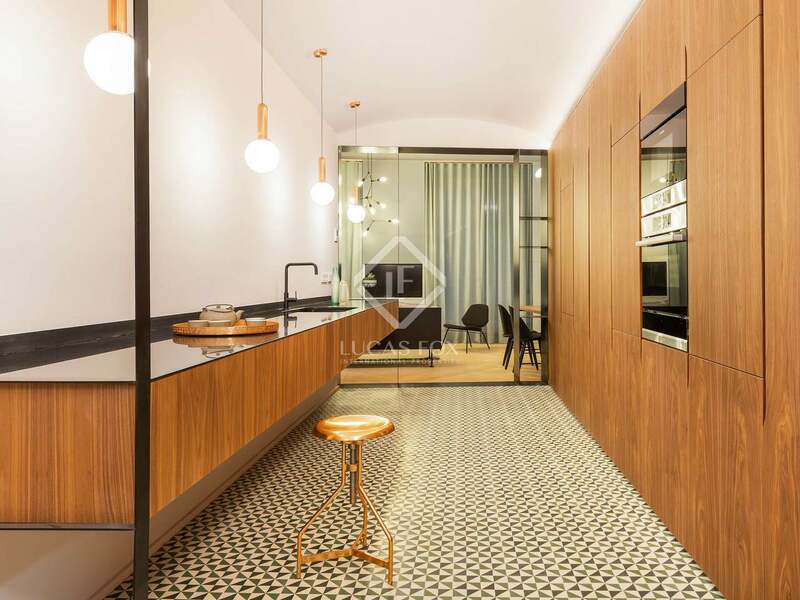 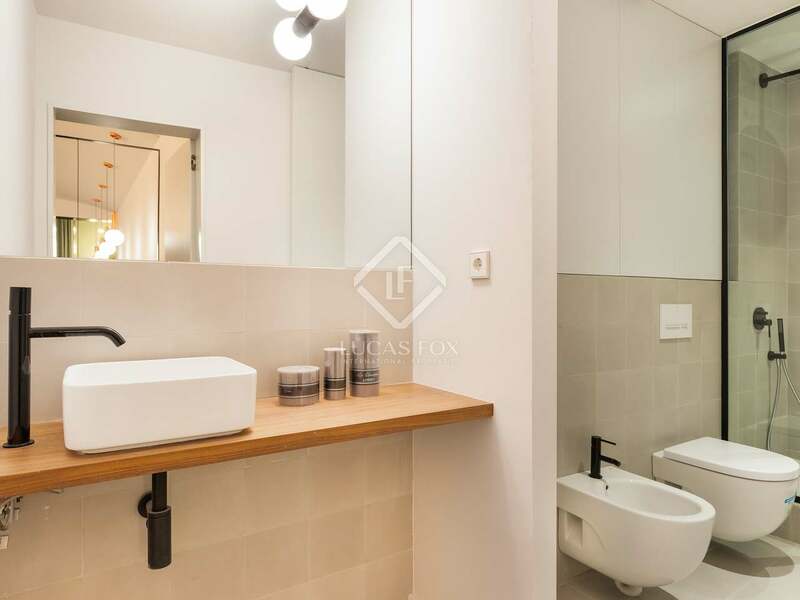 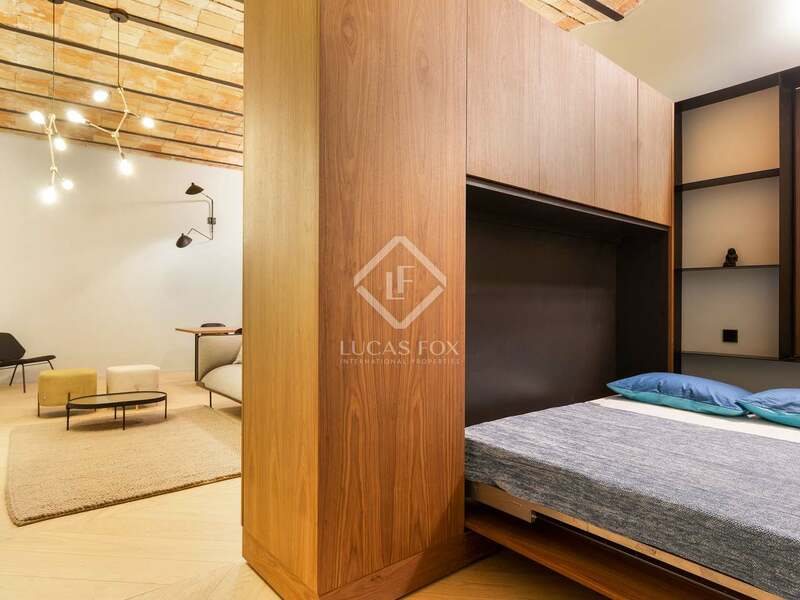 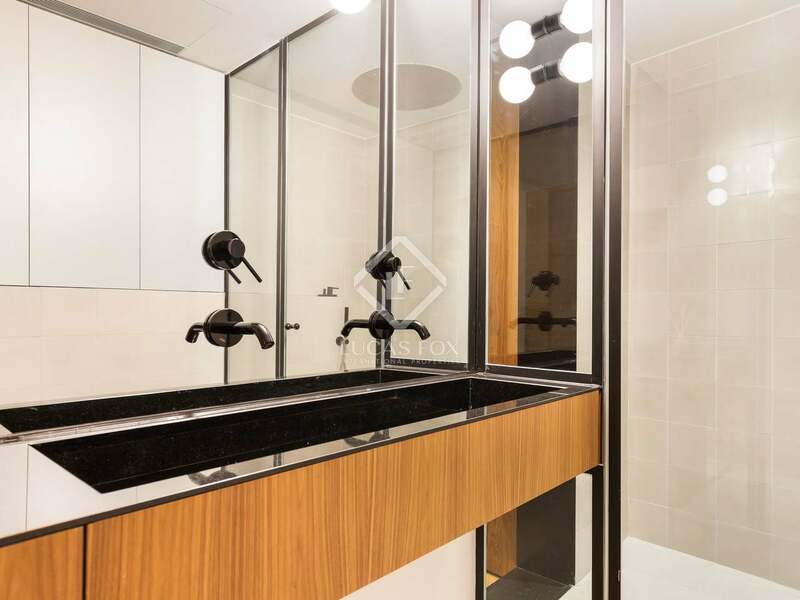 This impressive renovated apartment with luxury finishes and materials is located on the main floor of a building with a communal terrace in El Born, one of the most beautiful neighbourhoods of the city. 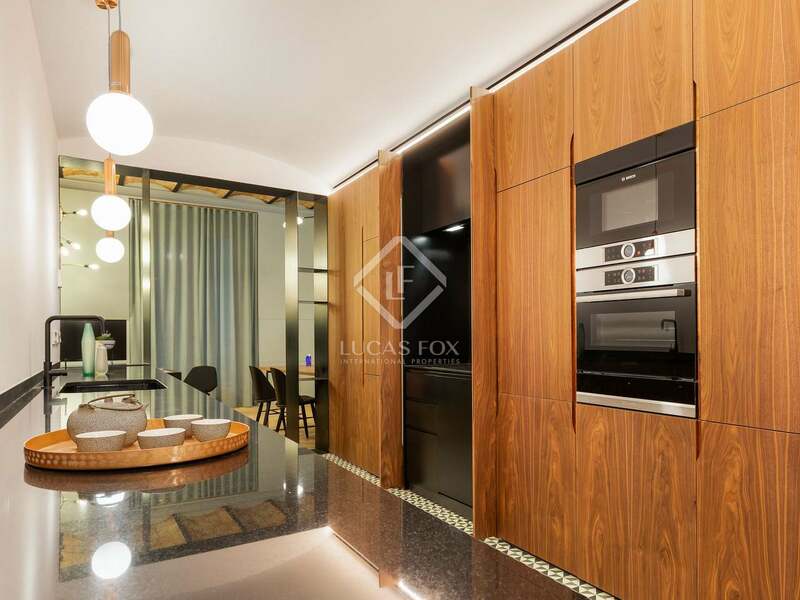 The property stands out for its designer furniture which was made to measure and helps create a spacious attractive environment. 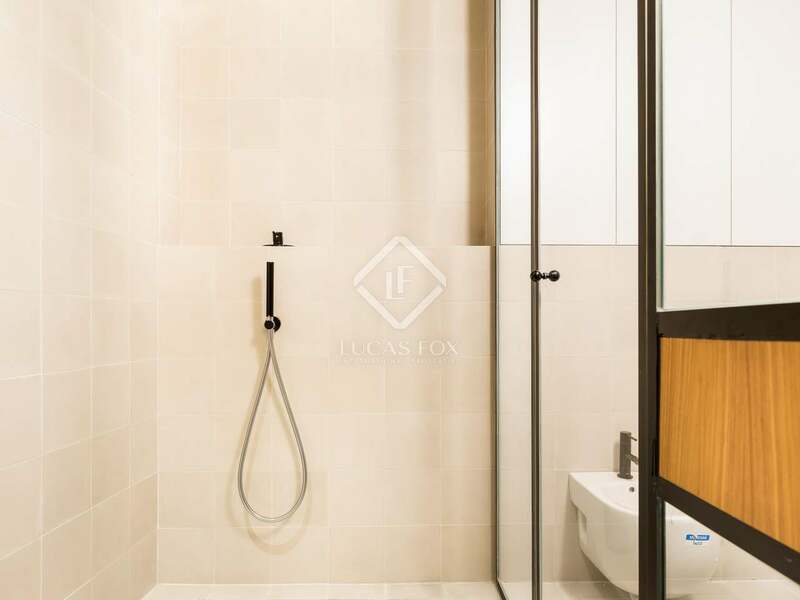 Upon entering the apartment, we are welcomed by a large hall with access to a complete bathroom. 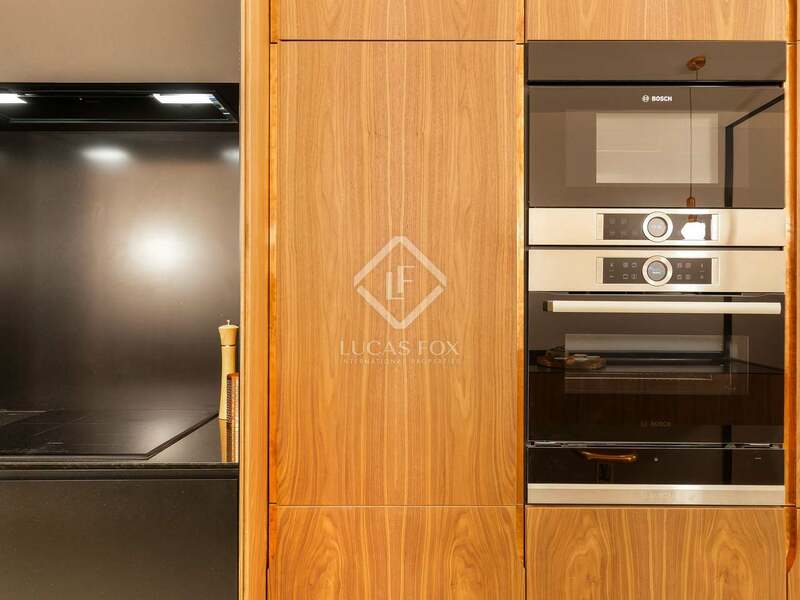 Next, we find an equipped kitchen fitted into the wall, covered with natural wood. 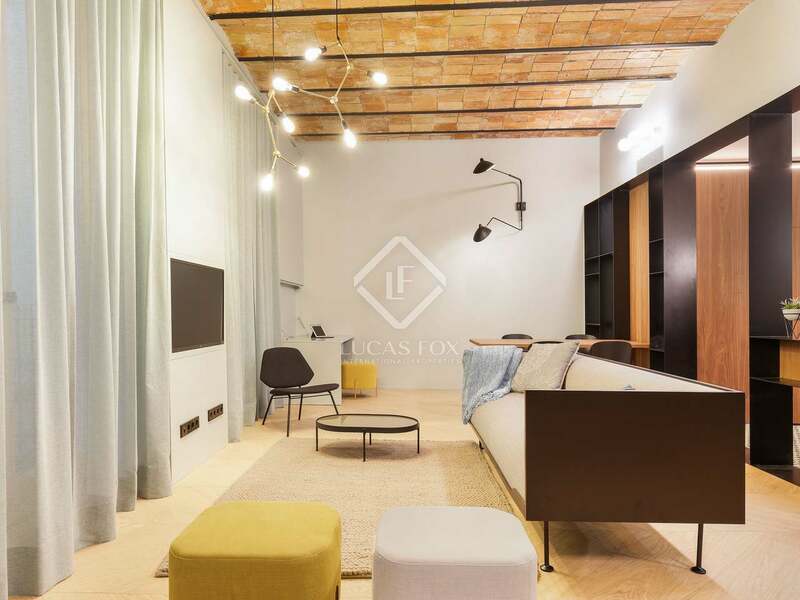 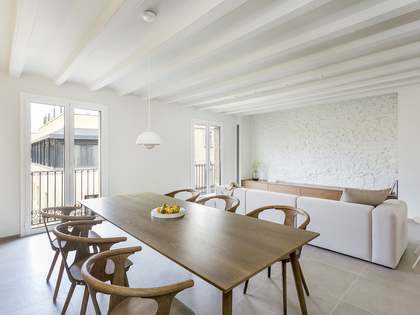 This room gives way to a large living room with access to 2 balconies overlooking Carrer Montcada, which flood the room with natural light. 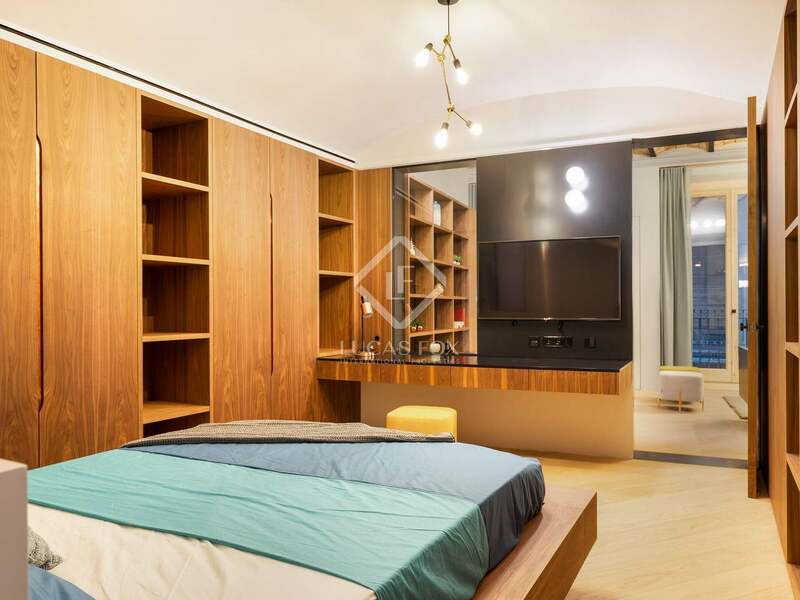 The apartment offers the possibility of creating a second bedroom thanks to a moveable shelves in the living room. 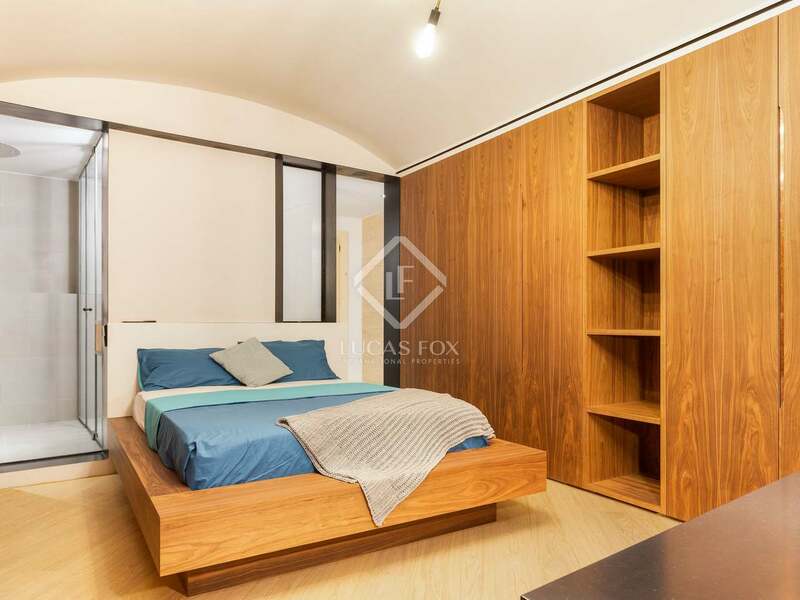 A large bedroom with fitted wardrobes and a private bathroom completes the apartment. 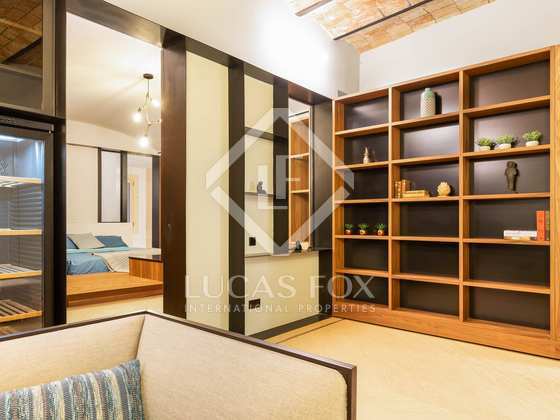 The property has high ceilings and wooden beams in some of the rooms, which gives it a special charm. 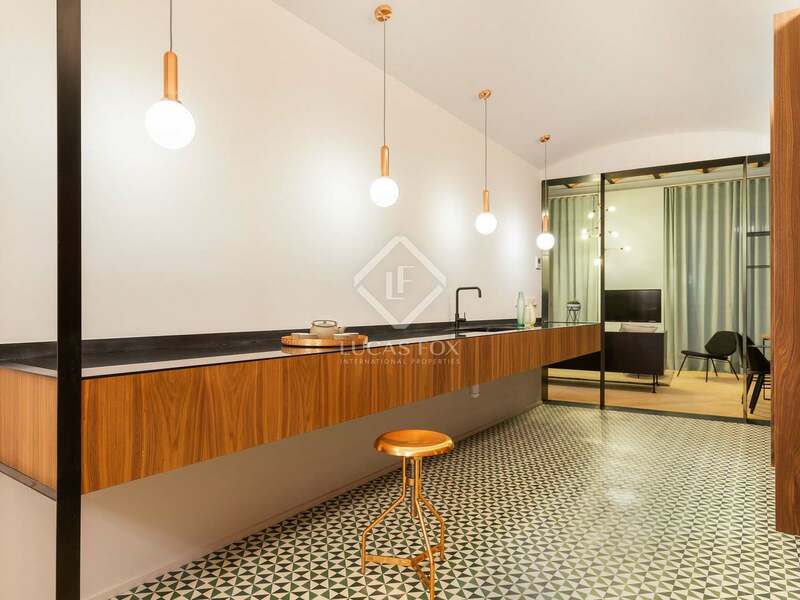 The floors are wooden in the bedrooms and in the living room and mosaic tiles in the kitchen. The apartment is also equipped with air conditioning and heating to ensure your comfort at any time of year, a home automation system to make your life easier and an alarm system to ensure your safety and that of your loved ones. Contact us to visit this magnificent apartment in the centre of Barcelona. 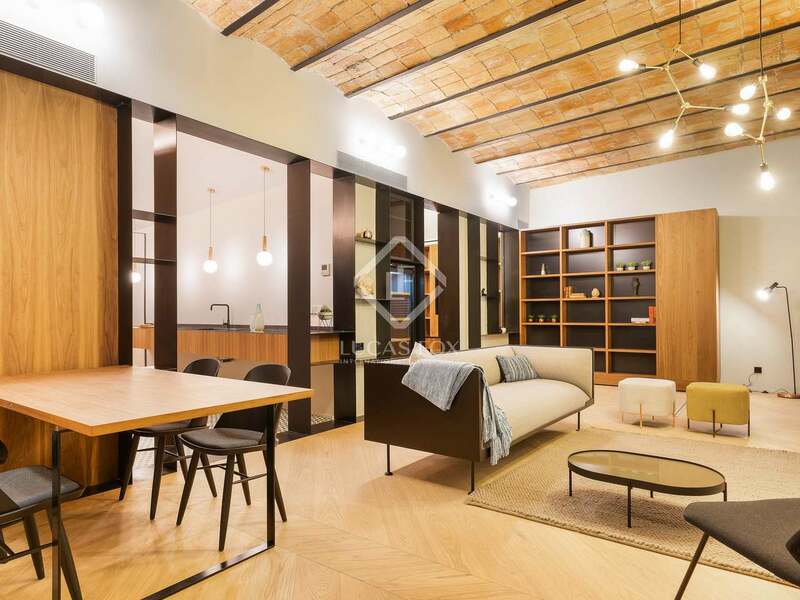 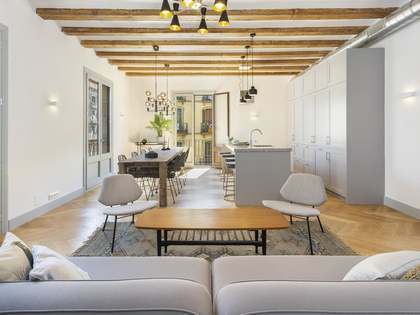 The apartment is located in the Born neighbourhood, one of the most emblematic areas of Barcelona, ​​known for its beautiful streets and buildings. 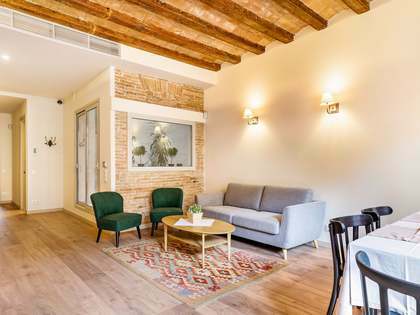 It is an area that is a few minutes from the Ciutadella Park, a green area where you can relax after a long day or practicing sports, and a few metres from Carrer Princesa and Via Laietana, in the heart of Barcelona, next to the Gothic quarter. 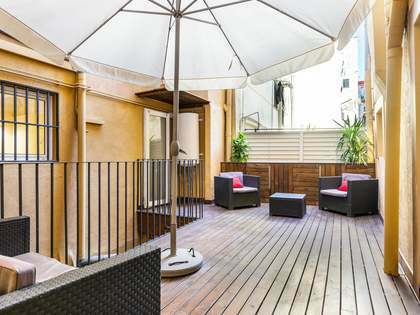 This neighbourhood is surrounded by pleasant restaurants and cafés, and trendy bars and entertainment venues. 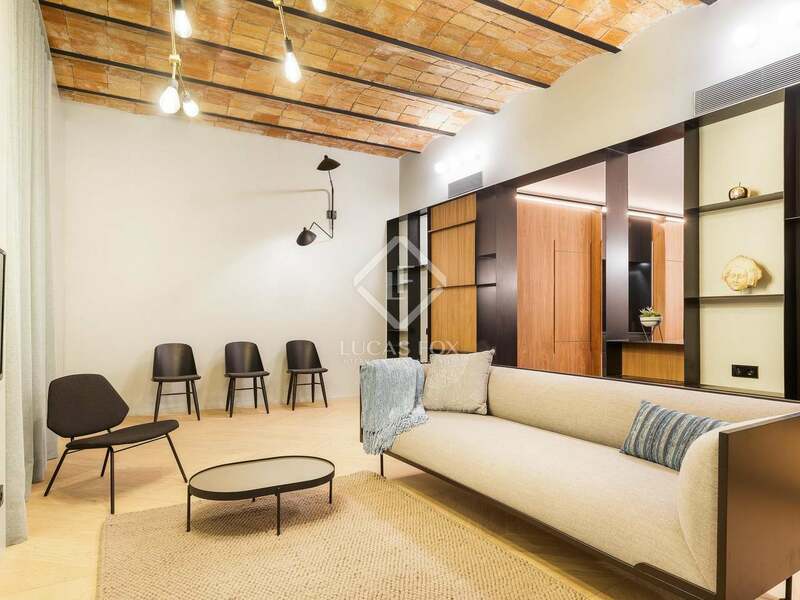 In addition, in this area you will find the most modern and alternative stores. 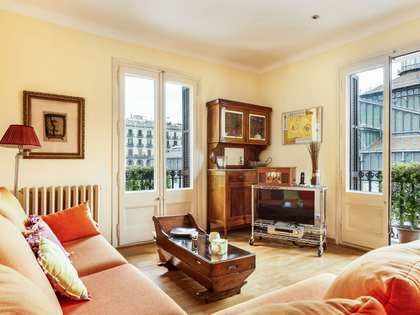 It also enjoys excellent public transport, so you can move comfortably around the city.